Rapid acting insulins are usually taken just before or with a meal. They act very quickly to minimise the rise in blood sugar which follows eating. Rapid acting insulins are commonly prescribed to people with type 1 diabetes, however, there may be times when they can be prescribed for type 2 diabetes as well. As rapid acting insulins act very quickly, they can lead to an increased chance of hypoglycemia. Care should be therefore taken when dosing. 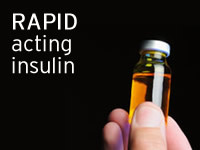 What type of insulin is a rapid acting insulin? Rapid insulins, which are a type of insulin known as analogue insulins, can either be injected or delivered via an insulin pump. Download an insulin duration chart for your phone or PC. Humalog is an Eli Lilly product, with the active ingredient insulin lispro. It is extremely rapid-acting, and will typically begin to work within 15 minutes. Effects of the insulin last for between 2 and 5 hours. It is faster-acting than soluble insulin, and is therefore extremely useful around mealtimes. Like many other rapid-acting forms of insulin, humalog may be combined with intermediate or longer-acting insulin for a longer period of blood glucose maintenance. The active ingredient in Novorapid is insulin aspart. When novorapid is injected, it is extremely fast-acting, and works rapidly to normalise blood sugar levels. It typically begins working after 10-20 minutes, and will last for between 3 and 5 hours. It may be injected before a meal, and sometimes immediately after, to ensure strict control of post-prandial levels. Often, insulin aspart formulations such as novorapid will be combined with other longer lasting (intermediate-acting and longer-acting) insulin. In this way, control over blood glucose levels can be maintained throughout the day.